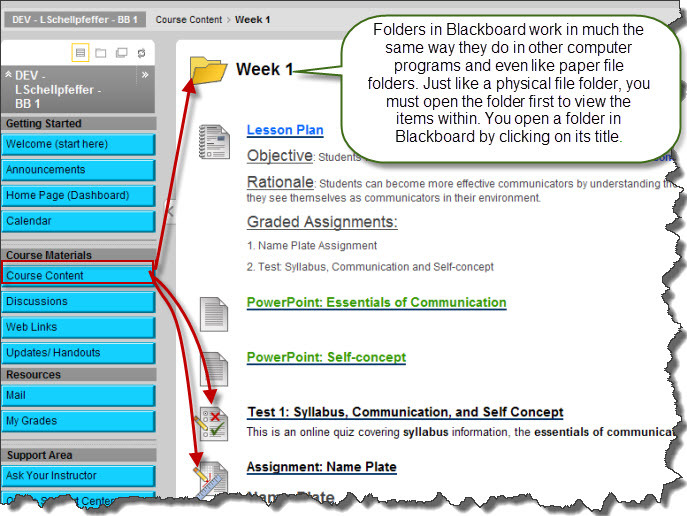 What does an Online Course Look Like in Blackboard Learn? Posted on Friday, September 17th, 2010 at 9:30 am. How does an online course looks in Blackboard Learn 9.1? Once you have entered a Blackboard course, you will always be able to see a list of buttons or links down the left hand side of the screen. This is known as the Course Menu. Use these buttons or text links to access and view various areas of the course. Each Course Menu may vary slightly depending on your teacher’s preferences. Keep in mind your courses may look a bit different from each other and have different sets of tools available. Upon entering a course, you will see something similar to the illustration. Notice that even within a course, the top area will remain constant. We refer to the tabs and buttons in that area as the Tab Area and they stay with you no matter where you are in Blackboard. 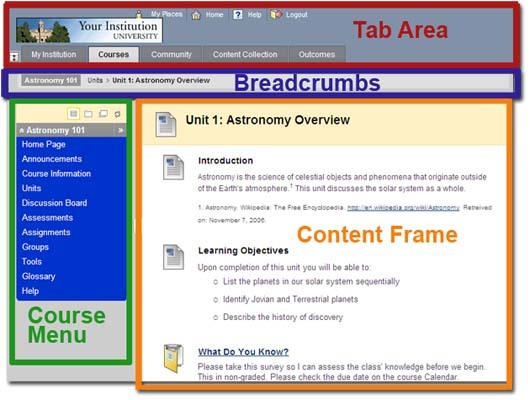 The Breadcrumbs allow you to navigate backwards to the previous area you visited in your course. 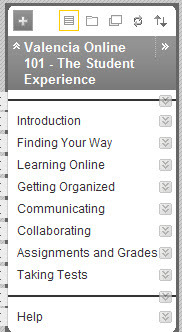 Your instructor has the option of organizing course content into folders. Inside folders you will find various kinds of items. Files such as PowerPoints, Lesson Plans, Tests and Assignments, Items containing text, images and weblinks.You will also find links to other areas of your course such as discussion boards and tests. Your instructor may make use of a Learning Module, which automatically sets a linear path for progressing through the content and learning activities. As opposed to scrolling down to see the information, you would proceed through a sequence of screens using the links on the Table of Contents or the forward and back arrows to move from one page to the next. Blackboard Learn 9.1 is open, flexible, and centered on enhancing your academic achievement. Below find links to interactive video tutorials on how to perform essential tasks in Blackboard Learn 9.1.